We are based in Somerset in the South West of England and we also cover parts of Devon, Dorset, & Wiltshire. Our music is a mixture of great fiddle led traditional folk dance tunes with a contemporary folk feel, including English, Irish, Scottish, Welsh, American and European repertoire. We can even throw in some songs! 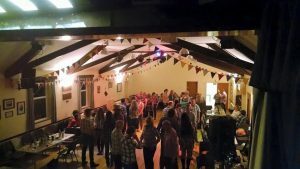 Barn Dancing is Fun Entertainment for all ages and abilities and I mean everyone, from toddlers to older gentle folks! Why book Hobsons Choice Barn Dance Band? We Look Forward to entertaining you..